Made using 100% domestic rice-malt. Contains chintan all-purpose seasoning for extra umami flavor. Simply defrost in the refrigerator or beneath running water to use. Each bottle is 220g and arrives frozen. Because our brewery-prepared shio koji plus arrives frozen, its enzymes are still alive. 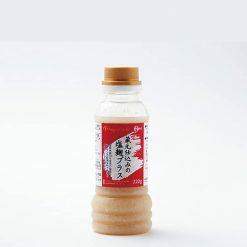 Differences between this product and other commercially available products: ① Some products use cooked uruchimai rice as well as rice-malt in order to lower their own retail prices. 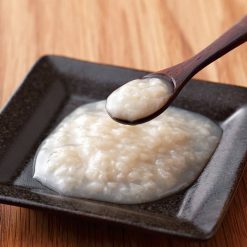 ② Heat or alcohol are used in some products in order to suppress enzyme fermentation, and as a result their shio koji does not become very soft. ③ Some products taste very salty, but are lacking in umami. ④ Seasonings with a mixture of shio koji and animal-based flavors are not usually available. Compared with other commercially available items, this product has 6.6% less salt. (Commercially available items 12% to 13%). Seasonings can be a crucial part of a meal, turning plain food into a delicious experience. After all, sometimes we only think we don’t like certain foods because we haven’t tried them with the right seasoning! Sugarlady’s brewery-prepared shio koji plus and other seasoning products are safe and free of chemical seasonings and additives, letting the true, natural flavors of the ingredients themselves shine – and allowing you to enjoy your meal without worry. Place the shio koji bottle in the refrigerator or beneath running water to defrost before use. It can be used to season or accent a broad range of foods.The koji is alive, and so once defrosted will continue to ferment. After defrosting, be sure to store it in the refrigerator and use as soon as possible. Separation may occur after defrosting, but will not affect the quality of the product. Shake well before use.You may see what appear to be dark brown fibers mixed into the shio koji. These are parts of the rice. This product contains rice-malt (domestic), concentrated chintan solution [table salt, pork extract, chicken extract, sugar, kombu seaweed extract, refined sake, laojiu (aged wine), yeast extract, enzymatically hydrolyzed wheat gluten, vegetable extract (onions, Welsh onions, soybean sprouts, ginger, garlic, carrots), pepper, bonito extract], table salt, (product contains wheat).. This product is not suitable for anyone with allergies to wheat, chicken or pork. Origin of ingredients: rice-malt (domestic). Prepared and packaged in Japan.